This groundbreaking collection is the first to focus specifically on LGBT* people and dementia. It brings together original chapters from leading academics, practitioners and LGBT* individuals affected by dementia. Multi-disciplinary and international in scope, it includes authors from the UK, USA, Canada and Australia and from a range of fields, including sociology, social work, psychology, health care and socio-legal studies. Taking an intersectional approach – i.e. considering the plurality of experiences and the multiple, interacting relational positions of everyday life – LGBT Individuals Living with Dementia addresses topics relating to concepts, practice and rights. 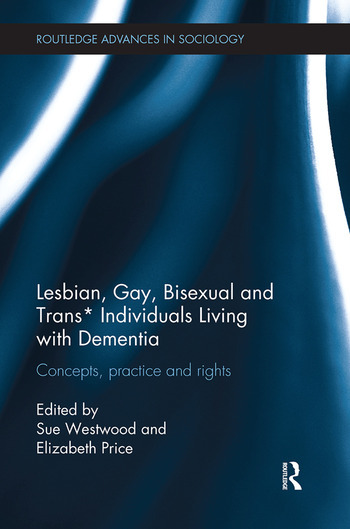 Part One addresses theoretical and conceptual questions; Part Two discusses practical concerns in the delivery of health and social care provision to LGBT* people living with dementia; and Part Three explores socio-legal issues relating to LGBT* people living with dementia. This collection will appeal to policy makers, commissioners, practitioners, academics and students across a range of disciplines. With an ageing and increasingly diverse population, and growing numbers of people affected by dementia, this book will become essential reading for anyone interested in understanding the needs of, and providing appropriate services to, LGBT* people affected by dementia. Sue Westwood is a socio-legal and gerontology scholar. She is a researcher at University of Oxford, Honorary Research Fellow at the Centre for Research on Ageing and Gender, University of Surrey and teaches Law at Coventry University. Sue previously managed a dementia adviser service for a UK charity. Elizabeth Price is Senior Lecturer in Social Work at the University of Hull, UK. She is a registered social worker and her research interests currently include the lived experience of chronic illness, sexualities and dementia, and the use of music as a therapeutic intervention.